EAGLES NEST CABIN WELCOMES YOU! THE EAGLES NEST CABIN AND THE SURROUNDING AREA IS A HIDDEN PARADISE, THE NATURAL BEAUTY IS RELAXING AND REFRESHING. THIS CUSTOM BUILT LOG CABIN HOME FEATURES YELLOWSTONE LODGE POLE PINE LOGS. YOU WILL ENJOY THE OPEN AND SPACIOUS LAYOUT. FOR YOUR COMFORT, CENTRAL AIR IS PROVIDED ALONG WITH CENTRAL HEATING. ALL SLEEPING AREAS AS WELL AS THE LIVING AREAS INCLUDE CEILING FANS. LOVINGLY DECORATED WITH A MAJESTIC EAGLE THEME. ENJOY A BEAUTIFUL VIEW AND THE RELAXING SOUNDS OF THE CRYSTAL CLEAR STREAM RUSHING WATERS FROM THE LARGE DECK, WHICH HAS TABLE AND CHAIRS - THE PERFECT SPOT FOR RELAXATION. THE LOWER LEVEL PATIO HAS LOG BENCHES AND A SWING. THIS CABIN IS AVAILABLE TO RENT YEAR ROUND. THIS CABIN IS FULLY COMPLETE WITH TWO TV'S, DVD PLAYER, STOVE, REFRIGERATOR, DISHWASHER, MICROWAVE, RECLINERS, CHAIRS AND DECK FURNITURE. LANDLINE PHONE AND WI-FI IS FREE, CELL SERVICE IS LIMITED IN THE VALLEY. THE BEDDING IS PROVIDED(CLEAN SHEETS, BLANKETS AND PILLOWS). THE FOLLOWING IS ALSO PROVIDED, TOWELS, PAPER TOWELS, KLEENEX, TOILET PAPER, GARBAGE BAGS, HAND, SHOWER AND DISH SOAP. THE KITCHEN IS EQUIPPED WITH COFFEE POT, POTS AND PANS, CROCK POT, TOASTER, DISHES, GLASSES, ELECTRIC FRY PAN, MIXING/SERVING BOWLS & ETC. SLEEPING ARRANGEMENTS ARE; QUEEN BED IN MAIN FLOOR MASTER BEDROOM, FULL BED AND TWO TWIN BEDS IN THE LOFT AREA, QUEEN BED IN LOWER LEVEL BEDROOM AND A FULL SIZE SOFA BED IN THE LOWER LIVING AREA. THE CABIN HAS TWO LARGE BATHROOMS. CHECK OUT THE FORT ATKINSON PRESERVE/FORT, BILY CLOCKS MUSEUM, SEED SAVERS EXCHANGE/HERITAGE FARM, THE WINNESHIEK WILDBERRY WINERY OR THE LAURA INGALLS WILDER MUSEUM IN BURR OAK, IA. DECORAH ATTRACTIONS INCLUDE THE PORTER HOUSE MUSEUM, LUTHER COLLEGE CAMPUS, VESTERHEIM NORWEGIAN-AMERICAN MUSEUM, STEYER OPERA HOUSE, DECORAH'S FISH HATCHERY, MALANAPHY SPRINGS, DECORAH'S HISTORIC ARCHITECTURE TOUR AND THE LOCAL GOLF COURSES. DECORAH WAS RECENTLY FEATURED IN SMITHSONIAN MAGAZINE'S ANNUAL LIST OF THE TWENTY BEST SMALL TOWNS TO VISIT IN AMERICA, AS WELL AS BEING NAMED IN FORBES "AMERICA'S PRETTIEST TOWNS" LIST. SOME THE BEST TROUT FISHING IN THE STATE OF IOWA IS OUTSIDE YOUR CABIN FRONT DOOR. FISHING FOR TROUT IS DONE YEAR ROUND. TURKEY AND DEER HUNTING ARE POPULAR SPORTS IN THE AREA. FISHING AND HUNTING GUIDES ARE AVAILABLE IN THE AREA. THE UPPER IOWA RIVER IS NEARBY AND OFFERS FISHING FOR MANY SPECIES. TAKE A TRIP FLOATING DOWN ON THE UPPER IOWA RIVER BY RENTING CANOES AND/OR FLOAT BOATS. THIS CABIN IS NON-SMOKING AND ALLOWS NO PETS. THE EAGLES NEST CABIN IS A GREAT PLACE TO RELAX OR BE AS ACTIVE AS YOU WISH. 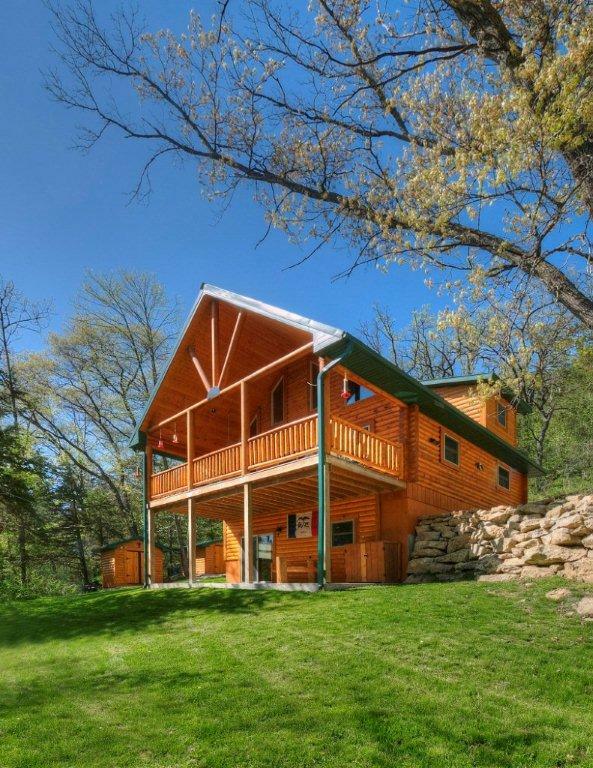 THIS CABIN IS LOCATED IN NORTHEAST IOWA, NORTH OF DECORAH AND IN THE HIGHLANDVILLE AREA. IF YOU ARE LOOKING FOR A CERTAIN TIME PERIOD FOR A POSSIBLE BOOKING - GO TO THE AVAILABILITY TAB AND YOU WILL SEE A CALENDAR WITH THE PRESENT BOOKINGS AND THE AVAILABLE DATES. EACH TAB WILL PROVIDE MORE INFORMATION ON THIS DELIGHTFUL PROPERTY.